From executive managers to businesses, administrations to non-profits, we meet the training needs of every type of leader and organisation. Regardless of the format or topic, all of our programmes aim to achieve the same goal: a lasting impact on your performance. Offering new perspectives, boosting self-confidence, honing judgment, updating approaches, renewing the drive to take on the skills and expertise to reach the next level… Different aspects of the Sciences Po experience stand out for each alumnus, but they all recognize how their career greatly benefited from their time here. A subtle (and very demanding) mix of courses and lectures, practical cases and group work, makes it possible to tie each separate element together, in order to give new meaning to our thinking and actions on a daily basis. This is a strong tool for professional advancement, of course, but also for personal development – and living up to the challenge of excellence delivers an incredible boost to self-confidence. For more than 40 years, 2,000 businesses and institutions (non-profits, public sector organisations, etc.) 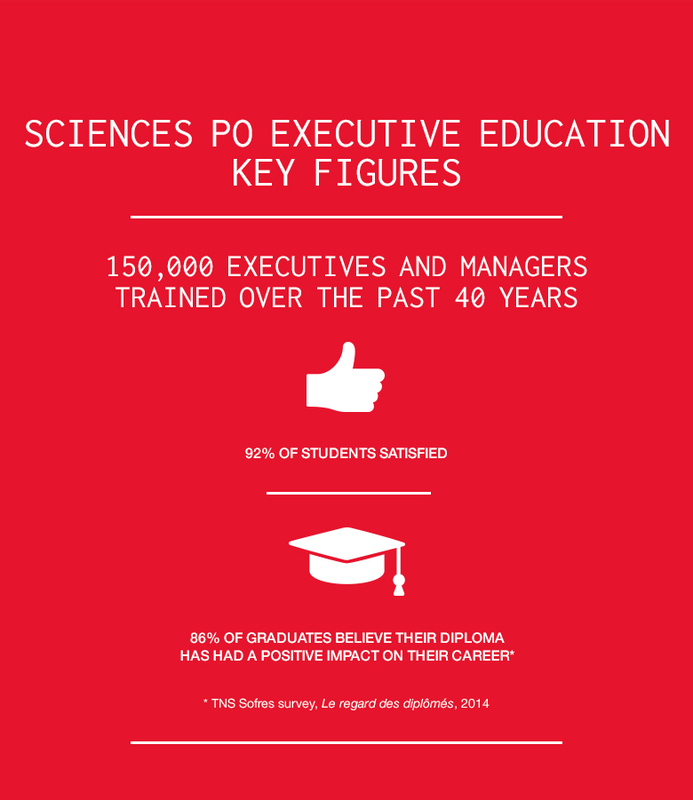 have trusted Sciences Po to train their executives and directors. We design tailor-made programmes that meet the specific challenges facing each business and organisation to enhance their performance over the long term. chose Sciences Po Executive Education to train individuals with the potential to take on the highest responsibilities with labor unions and workforce representatives on the Group level. Workforce representatives and labor unions work continuously to develop our Group’s social policy. For this reason, we gave the Union Coordinators at our Group the chance to obtain an Economic and Social Culture Certificate. The content of the course met all of their needs and helped improve our social dialogue. For several years we have offered a professionalization course to our newly appointed HR managers. In collaboration with Sciences Po Executive Education, we recently overhauled this course and designed an innovative and highly personalized program, enabling HR managers to gain a better understanding of the strategic challenges of their position, all while fine-tuning their HR practices.